My last day in Greece was a bit more eventful than I was hoping. I had expected an easy ride from Komotini to the border at Kipon. It did indeed start easily and I was ticking along through some nice Greek countryside – I stopped in a small village for a coke and sat and chatted with a Georgian and a Ukranian randomly living in rural Greece (I say chatted, we didn’t have a mutual language to communicate properly with but did our best). Then my problems began as I rode off on what I thought was the right road up and down some quite hilly country for about 8kms before I decided to make sure I was on the right track with the GPS on my phone. I wasn’t, I was going a different route from that which I had planned. All was not lost I thought, looking at my phone it seemed I could keep going on this route and I would get where I wanted without too much added on. I was wrong, very wrong. After riding another few kilometres, I ended up at the top of a very steep hill in a village that was effectively the end of the road. An old lady sat holding a child and when I said the name of the place I was headed to, she pointed back where I came from. About an hour and a half after I left the Georgian and Ukranian ladies, I was back to their confusion. I then asked for directions and got off on the right way to more brutal hilly Greek countryside in the heat. Finally I got back onto more travelled roads and the town of Alexandroupolis which I went through quickly realising I was running out of day. Then the thunder and lightening started. On my left was a huge thunderstorm, on my right was blue sky. Somehow I managed to stay sort of in between the two and to only get a little showered on. The storm was quite impressive though with lightning shooting along horizontally at one point, which is a new one for me. The rain continued as I went, more an annoying drizzle than anything thankfully. At this point about 15kms short of the border, with darkness not too far off and with no idea what the storm was going to do I decided to stop at a hotel if I saw one. At the next town of Feres I couldn’t see one (though I didn’t go into the centre) and carried on. 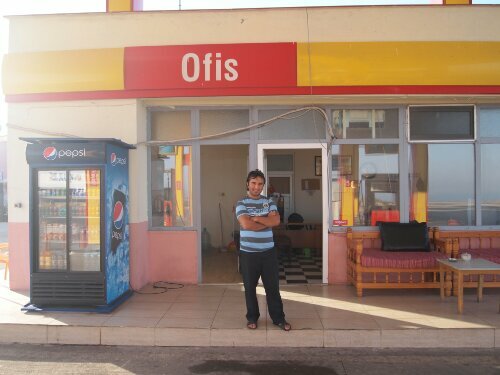 At the next town they said there were hotels back in Feres but none ahead as far as I could work out. At this point I almost turned round but I felt I had probably another two hours before it got really dark so I decided to make for the border with Turkey…surely there would be a hotel close to the border. Unfortunately my map is 1:800000, so every centimetre is 8km, which is not very detailed and I couldn’t work out how to get to the border without taking a motorway. So I ride up to the Greek motorway to have a look. I can’t see any ‘no cyclist’ signs, there is hardly any traffic or anything around so I decide to chance it on the basis it isn’t that far anyway. Next thing I am speeding down the motorway hard shoulder trying to do my fastest 8kms ever. Hoping I wouldn’t see any Greek police cars coming to pull me over. I needn’t have worried, I barely saw any traffic and made it to the border very quickly to be greeted by a few strange looks from lorry drivers. By the time I got through it was pitch black and I still had about 10kms to Ipsala the nearest town. It was too dark to find a pitch to wild camp so I decided to make for Ipsala. It was a little nerve wracking riding into a new country in full dark with no firm destination. Luckily everything worked out and after about half an hour of riding I ended up in Ipsala and at what I believe is the towns only hotel. The place was nice and cheap (about EUR10) and even had a warmshower. Sadly the only working light bulb in my room was in the bathroom and the toilet was permanently flushing. I’d stayed worse places for more money though and I didn’t even mind when I was woken at 4am by a loud conversation a few rooms away. In the dark the town had been a bit intimidating in the light of day it was a little better and I bought some fresh bread at a little old bakery and rode for Gelibolu (Gallipoli). 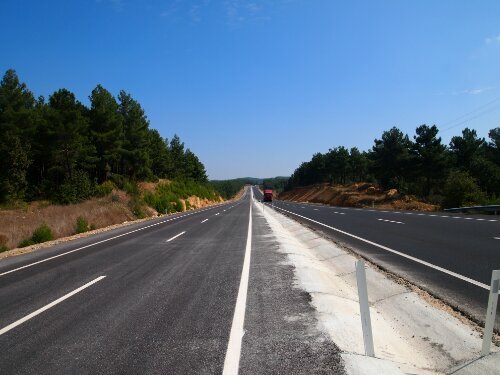 Riding in Turkey you immediately get a sense of the size of the country – the roads are wonderfully wide and great for cyclists as the hard shoulder is massive for the most part. It is like you get your own lane. Sometimes I did as they had closed a whole side of the road for repairs. I was very fortunate to be hosted by Esra from couchsurfing and it was nice to get to stay in Turkish home on my second night in the country and to eat some Turkish food and soup. 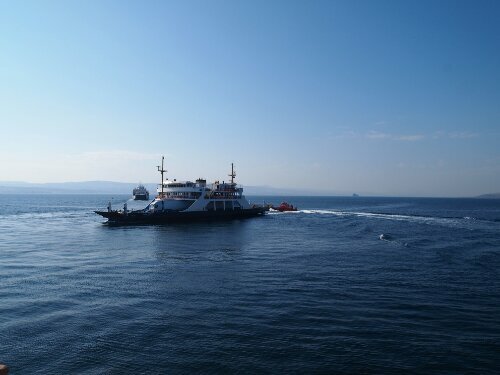 The next day I took the ferry to Cardak and headed towards Bursa. Crossing with the ferry felt quite strange as I was now definitely leaving Europe and crossing in to Anatolia and Asia. It was another wrench as I moved further away from home and put another barrier between me and England. As mentioned the Turkish roads are very wide and from Gelibolu towards Bursa they intially didn’t seem to change scenery that much. I was starting to get a bit bored, then I realised I could read my kindle while I rode. I just stuck it in my map case and read away as I went. This has made the riding experience a lot more enjoyable, the only problem being that I am afraid the kindle will overheat in the strong afternoon sun! 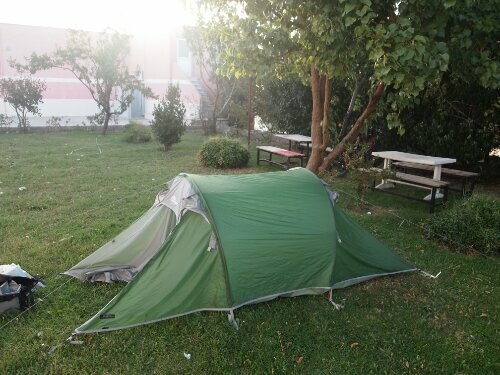 I had read on the internet that it was possible to camp at petrol stations in Turkey. Generally they cover quite a large area and include a picnic spot for people to eat lunch at as well as toilets. So on the first night out of Gelibolu as the day was ending I decided to test this out at a petrol station I reached at the right time. Thankfully it turns out that it is possible. All I had to do was ask and the guy was quite happy for me to pitch my tent out the back and use the toilet. He also invited me into the office to watch TV. Going forward I can see myself staying at quite a few petrol stations! The next day reaching Bursa I was treated to my worst traffic to date. 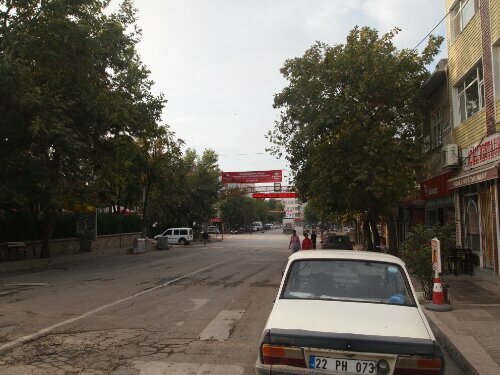 Bursa is a fairly large city of 2 million people and there were a lot of cars streaming into the city. The outskirts started about 15km out and I had a very stressful 15kms as my massive hard shoulder disappeared to nothing. It was the first time I have crossed my fingers as I rode, even worse than the ride into Tirana!